mollie's mom: ORC - Post One - Does She or Doesn't She?? through a couple of challenges. There are professional designers who create amazing rooms. Great ideas. They are fun to look at but what I like best are the many, many rooms created by bloggers and their progress is posted every Thursday. and the creativity is off the charts. Sort of a "necessity is the Mother of invention" push to create amazing rooms. I loved seeing what was going on in "real time" with "real life" projects. It seems to be a great motivator to get a room completed. Who doesn't need that little push to wrap things up? Around here we tend to be 85%ers. and then fizzle out and don't quite seal the deal. I don't know if I lose interest, run out of money or time, want to go get margaritas and guacamole, or want something I can't find or afford to put the cherry on top and finish a room. I'm thinking about jumping in with the smallest room in my house that isn't a bathroom. And the designers and linking bloggers usually post inspiration pictures. I have a great starting point for my inspiration. I found this bed at a nearby Goodwill in February. It has been leaning up against bookcases in the Library since then. See what I mean? It was in fantastic condition. A very nice Stanley daybed with cane detailing. I couldn't believe it was not sold! It needs a coat of paint. Stay white? Fun color? Isn't this an awesome motivator?? but this one is pretty amazing. Spoiler alert: I left the brown and blue striped chair on the right behind. 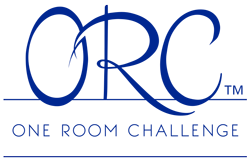 And be sure to visit Linda's blog and see all of the ORC Linking Participants! I checked out the ORC "Invitees" yesterday and they are going to be awesome to watch - some of my all time favorites are in the line up!! looking fwd to seeing the project! Thank you!! I'm a little nervous about jumping in without much planning but you know I may find out I work best this way!! SUCH a great find! Definitely looking forward to following along! Thank you. It was an amazing find - I snapped it up and then looked it up and people are getting hundreds for it on resale!! right time - right place!! Excited to see what you do with the daybed. Good luck over the next few weeks! What a gorgeous daybed! I cannot wait to see the results! Love the daybed frame! Can't wait to see you incorporate it into a room. Thank you Linda. I have loved the ORC and followed it each time. I am quite nervous about pulling this off and excited at the same time. I'm overwhelmed by everyone's plans - I think I came a little late to this party!! I've got to get busy! !